Thank goodness I am a writer. If I weren’t then I doubt I’d have survived this merrygoround they call a mobile life. In the last 28 years I’ve lived in 6 different countries with four different languages, lost my identity and found it again. Boy, am I glad I ‘saved’ my life. Not only in the form of my memoir, a Moving Landscape, but using writing as a form of therapy has been a godsend. Read my post on the superb Expat Harem blog here and be sure to have your say . . .
Would you like to review my 26th book – A Moving Landscape? I can’t believe it, but I just wrote my 26th book. It’s been a scary old process this, because, for the first time ever, I am publishing my poetry and my memoir at the same time. Yep, that’s right. My life in verse. You see, I don’t admit it to everyone, but I write poetry too. Non-fiction, fiction, journalism AND poetry. So there you have it, 30 or so years of my life exposed for all to see. Those who did know of my poetry habit have been begging me to publish for years, so I guess I wrote it for you. In this month’s Acclimate, the expat mag from Bangkok, they have published a preview selection of poems. If you would like a review copy for your publication, then go ahead and send me your address and I’ll post you one. If you want it faster, I can send you a PDF. You can order it on Amazon too. I am delighted to announce that within minutes of my 26th book being published Craig Toedtman, President of Options Resource Careers in PA ordered 200 copies for his clients. ‘This will be a great addition to our packets….with hopes of many more orders to come!’ wrote Craig in an email to me in which he confirmed his order. 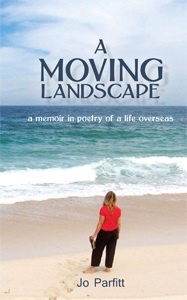 A Moving Landscape is my memoir in poetry of the 21 years I spent overseas, moving from Dubai to Oman, to Norway, England and now to the Netherlands. It tells of reality of culture shock and loss and settling in as well as the immense pleasure I have derived from the variety of landscapes in which I have had the privilege to live.